Now that your account is setup and your website is live you may want to learn how to Navigate around the console. 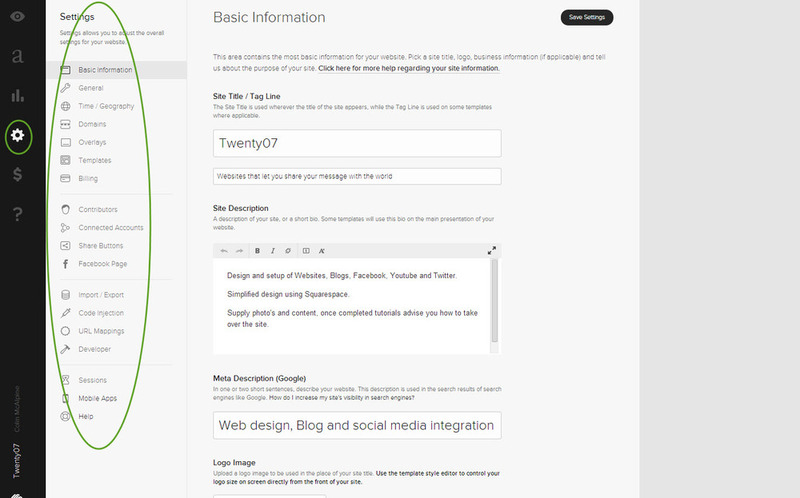 Below are the main navigation links for you to have a look at. As your are becoming familiar with the Squarespace platform I would not recommend at this stage trying to edit or delete anything. To enlarge any of the images below please click on them. Login as normal and you will be taken to the main admin page as below. This is the large a symbol in the black column, this column remains the same wherever you are.. The next column is the navigation and in this case list all your pages. We are on the Home page of the website and it shows the Home page to the right. If you were to click on the text you could edit, delete etc and if you saved it would update your live website. The View Page circled shows how the page looks live in a browser and the Page Settings gives you access to information about the page for Google. The Graph icon shows you the activity on your website. How many visits, what type of browser they are using, how they got to your site and others. Google Analytics provides more detailed information and you should, if not done already, look into setting this up. You can also select Hourly, Daily, Weekly and Monthly reports. The Gear Icon is the settings page. This is where a lot of the structure of the website is. Information about your site for Google and other Search engines, setting the time zone and location of your business. Google Analytics code can be entered. Your account and contact information as well as connecting any Social media accounts you may have. There are also some more advance links for develops only. The $ icon is for your E Commerce, you may not use this now (or ever) but it is their if you need it. It will allow you to enter product items, descriptions and prices and link to your payment gateway to create an online shop. The last 3 icons are the ?, your website name and the Squarespace logo. The ? takes you to a help desk within Squarespace where you can search for information or lodge a ticket. You can contact us if you like first. If you click on your website name you will see a pop up box that allows you to enter and edit your profile, add a bio for example.